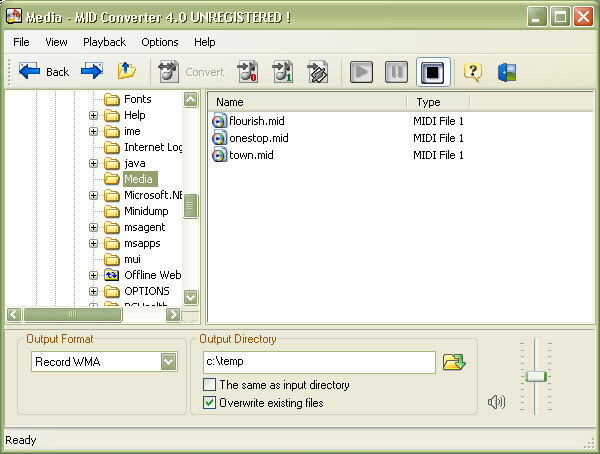 MID Converter includes several MIDI tools in one. MIDI to Audio (WAV, MP3, OGG, WMA) recording feature lets you easily record MIDI files to the most popular audio formats. MIDI types converting tool lets you to convert various .mid formats from one to another. The program also features the built-in sequencer engine. That allows to playback MIDI directly in the program and record to Audio with the highest quality. At least, batch conversion mode saves you the time and hassle of individually converting the files to the desired file type. Along with the ability to batch convert you can, of course, carry out single conversions. Converting of file fragments with user-defined start and end positions is another amazing feature of this unique software. mid 0, mid 1, riff mid 0, riff mid 1. Supported Guitar Pro formats: Guita Pro 3, Guitar Pro 4. Convert MIDI to MP3, WAV, OGG, WMA, AAV, FLAC, APE files in batch. Convert MIDI to MP3, WAV, WMA and OGG formats. Convert MIDI to WMA, MID to WMA and RMI to WMA file format. Converts MIDI files to WAV, MP3, OGG and WMA. Convert multiple-instrument WAV to MIDI, MP3 to MIDI, CD to MIDI, WMA to MIDI. Qweas is providing links to MID Converter 4.2.3 as a courtesy, and makes no representations regarding MID Converter or any other applications or any information related thereto. Any questions, complaints or claims regarding this application MID Converter 4.2.3 must be directed to the appropriate software vendor. You may click the publisher link of MID Converter on the top of this page to get more details about the vendor.